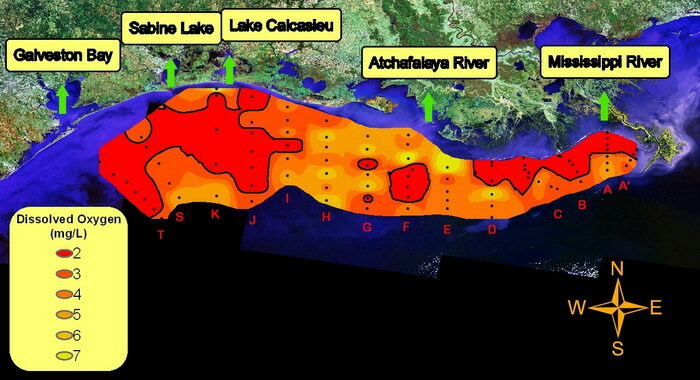 Mapping the extent of hypoxic water (< 2mg/L) across the Louisiana and Texas inner to mid continental shelf, along with associated physical, chemical and biological parameters. Associated rate measurements of biogeochemical processes. National Oceanic and Atmospheric Administration, Center for Sponsored Coastal Ocean Research, NGOMEX09: Integrated Ecosystem Modeling of the Causes of Hypoxia (Rabalais et al. ), grant numbers NA09NOS4780204 to Louisiana Universities Marine Consortium and NA09NOS4780230 to Louisiana State University.